When the weather in RL is as nice as in SL...Get out of the house! That's exactly what I'm doing! I love having enough land/prim to have several skyboxes in SL. One I have in Caledon Mayfair is open to the public - basically it's open to anyone who discovers it, or to a few people I know who need a large building platform. 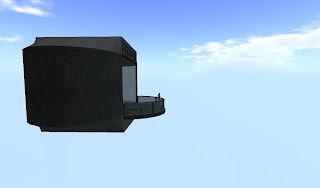 Sometimes I'll go to one of my skyboxes and stay the entire time I'm inworld. Now you may be wondering..."If I IM Zoe, is she wearing any clothes?" "British brothers William and Richard complain about their rigorous job responsibilities under the Rebellion...."
Big Dogfights for Tiny Avatars! Officers of the Royal Caledon Air Force are planning 3 dogfighting sessions within two days of aerial combat fun during the first weekend of May 2008. 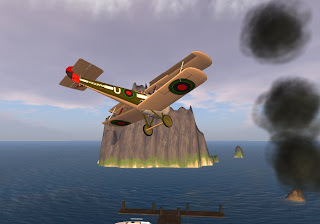 All participants will meet at the Connolly Aerodrome in Caledon Penzance at 10:00 AM SL time on Saturday May 3rd or Sunday May 4th (or both days if you prefer) for what may be the biggest air battle ever fought by tiny avatars! 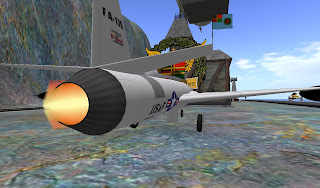 We have also added a 12:00 AM (00:00) SLT Midnight Tiny Dogfight for the wee hours of Sunday morning. That's 3 aerial battles in the same weekend! All you need is a tiny plane with the Terra Combat System (TCS) and a tiny avatar. A tiny dog avatar would be perfect, but if you have your heart set on another, we'll be glad to see you in another tiny incarnation. Everyone is welcome. 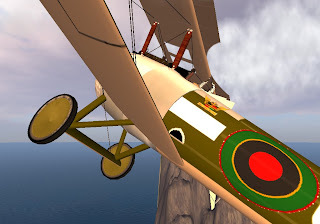 You do not need to be a Caledon resident or pilot with the Royal Caledon Air Force. 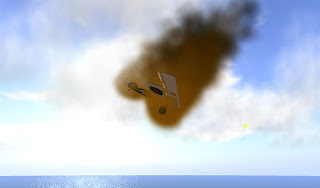 All we ask is that you join the RCAF group during the time of the event itself to facilitate communication in group chat during the events and use a tiny avatar and tiny plane during the dogfights. Tiny planes will be provided by RCAF Marshal Zoe Connolly. The Tiny Avatar you use is up to you. Once we start, air battles usually last 30 to 40 minutes. "This is the social network for Battlestar Galactica fans by Battlestar Galactica fans. 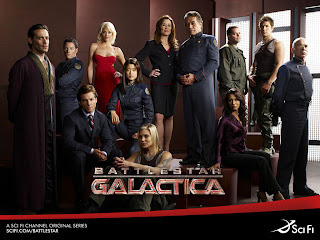 Add blog posts, share Galactica related video and photos, and keep in touch with other fans." 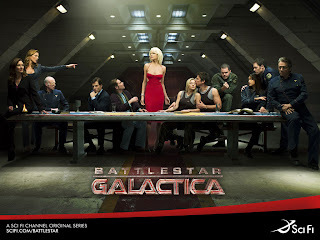 "Gaius Baltar tears the fleet apart -- again -- by telling people to believe in the Cylon god...."
"Top Ten Reasons to Watch the New Season of 'Battlestar Galactica'" from "The Late Show with David Letterman." "Michael and Dwight decide to surprise Ryan in New York for a night of clubbing and to meet his friends...."
Everything is in flux at the moment. "Kara leads a lonely search for Earth as intrigue and strife plague humans and Cylons alike..."
"After breaking up with Jan, Michael realizes it is time to start dating, again..."
I made another appearance in someone else's Bitstrip today. How awesome! I even had a line in this one. The writer has captured part of my real life personae: My continuing need for the acquisition and consumption of coffee. I am the Coffee Huntress! "....Civire are the backbone of the Caldari State. Their diligence and unselfish efforts have built it from the grounds up. 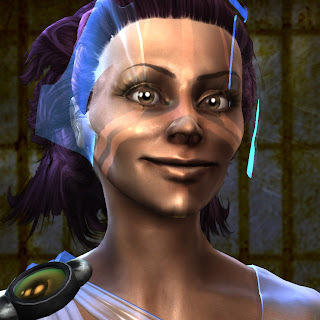 The Civire are cool, level-headed and relentless in their approach to both trading and fighting. They are more comfortable acting than talking and are never happier than when embroiled in the midst of frenetic activity. They can handle pressure extremely well, an invaluable aid in combat and other stressful situations. 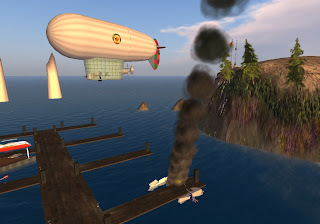 Many of the best bounty hunters around are Civire..."
Airliner crashes into Caledon Penzance Building! The Adventures of Dale Starfield! Okay it's really a tutorial for the game EVE Online. But this is basically how it looks and feels. 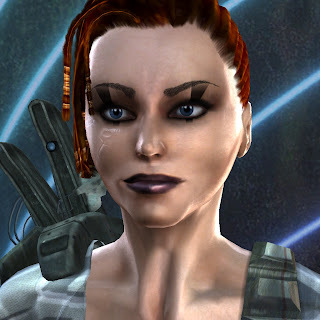 Dale Starfield is my character name within the virtual universe of EVE Online. 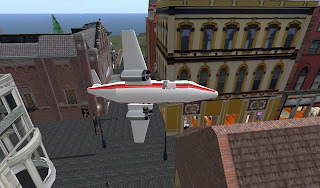 Fascinated by Mr Blancos Milestone's airplanes, I returned to his store to buy a few more of his fine aircraft. I was pleased to find a new addition to his collection. 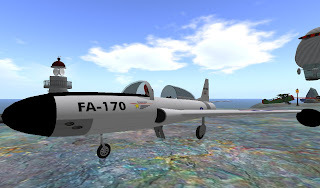 The 1950s Era F-94C Starfire Fighter Jet....which I promptly purchased for the reasonable sum of 900 Lindens. 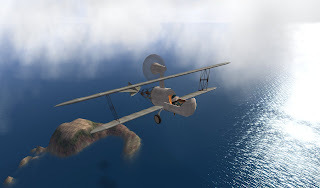 I quickly learned the basics and took to the air over the Caledon Firth for 3 test flights, making successful landings at Connolly Aerodrome twice. 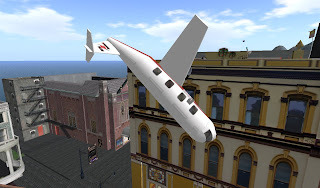 This is definitely one of my favorite planes in SL. Now I just need a good wingman! Officers of the Royal Caledon Air Force are planning two days of aerial combat fun during the first weekend of May 2008. "....Internal conflicts plague both humans and Cylons as issues of faith and loyalty boil to the surface...."
I'm considering a free trial of EVE Online. It looks fantastic! "Curatores Veritatis Alliance The Amarr Empire eve online...."
A participant-created weekend with banquet, dance, Shakespeare Festival, workshops, teas...."
"Amazing! 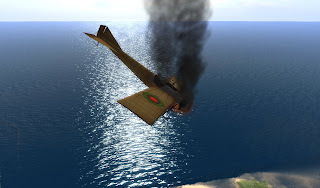 I flew a 199 prim B-17 for 15 minutes! No crashes, safe landing! Woohoo! 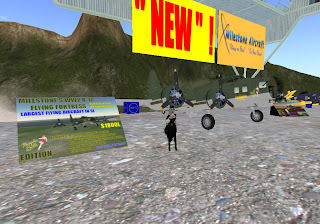 :from Caledon Mayfair [22,221,733] in SL"
I was drooling over this B-17 on display and just *had* to add it to my collection. 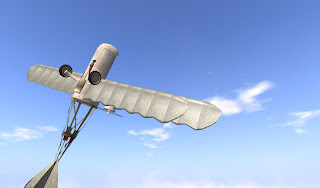 This is a "wearable" aircraft that attaches to your avatar. Each of the four engines has a separate start-up. I'll have more on the B-17 in an upcoming WeGame video. Mr. 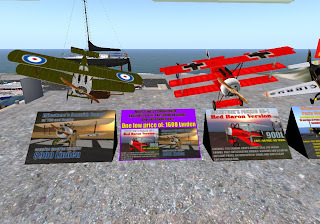 Milestone also offers detailed Sopwith Camels and Red Baron Fokker DR-1s, sold separately or both in one combat pack. 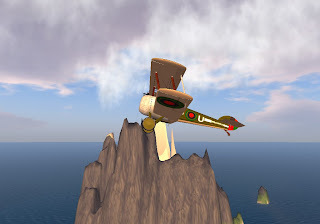 Squadron Leader Laval greets me upon a successful landing in Denver Hax's Tiny Boojum Bomber. Yes you heard it here first. I'm planning an all tinies dogfight in a few weeks. 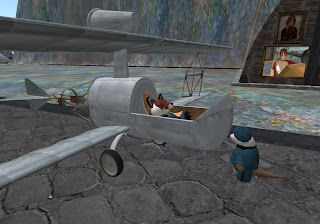 To participate you must have a tiny dog avatar and use one of the free tiny aircraft generously provided to RCAF by Denver Hax. I'll make the aircraft available at the aerodrome. Your tiny dog avatar is up to you. More info later. This is my first video since the major upgrade for SL Windlight users. Note that the text is legible once again and the details are back. 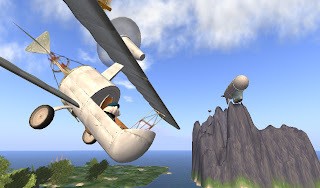 The video itself shows preparations for a free-for-all Ironclads battle in the 19th Century sim known as Antiquity in Second Life. This is a very fun tool and shows I'm tweetin' my heart out over here! "....A comic Faustian tale about a milquetoast short-order cook who will sell his soul to win the heart of the woman he loves...."
"...QUILLS imagines the final days of the Marquis de Sade as a blistering black comedy thriller, a battle between lust and love - and between the brutality of censorship and the consequences of free expression..."
Might try a new virtual world called "Dreams(R)(TM)" available on the "Sleep(R)(TM)" Client using the "Bed(R)(TM)" platform. 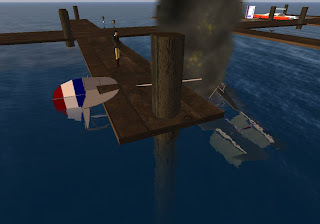 March 2008 Party Reaction: Congratulations to Crap Mariner! 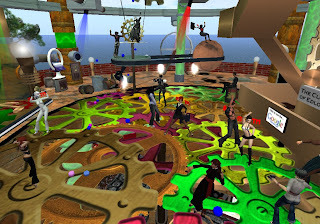 I had a blast at our Second Life Bloggers March 2008 Party hosted by Crap Mariner at his clocktower. I was so busy reading and writing chat, I forgot to do a machinima and have very little photographic evidence for the impending registered trademark lawsuit. Ah well!